We all want granola to be healthy. But some granolas are so sweet they could easily qualify as candy. But since I tend to spend the better part of the day roaming around my apartment sticking my hand in various boxes and jars of stuff to eat, I wanted to come up with a granola that was satisfying enough for breakfast, but one that I didn’t feel so guilty about dipping my hand into throughout the day. I never used to eat breakfast. Then, after trying to remove some of the damage done to my belly by years of gorging on restaurant food, I enrolled in a tough exercise class in San Francisco. It was excruciating and grueling, as our fierce instructor really pushed us. But we all bonded as a group (sometimes, successfully against her wrath). But one day we were all particularly wiped out and she stopped the class, went around the room, and asked each of us what we had for breakfast that morning. The majority of us answered, “Coffee.” Or maybe “Coffee…and half a leftover bagel.” She berated each of us after we spoke, because we were all working hard and told us that we needed to fuel ourselves by eating more than we were for breakfast. After that, I started eating more in the morning. I still like just toast and coffee right after I wake up – and definitely no talking, and no sudden movements, either. 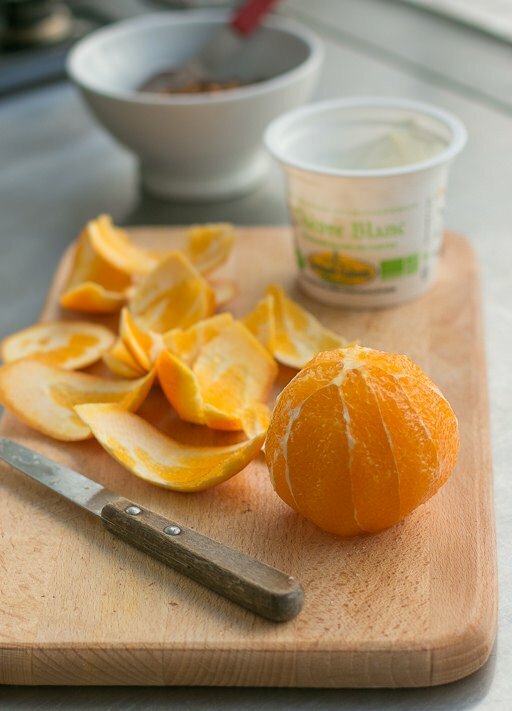 But come mid-morning, I prepare myself a big bowl of fresh fruit and yogurt or fromage blanc a boost of energy. Peanuts are packed with protein and dark chocolate is rich in magnesium and anti-oxidants, so I decided to stir up a batch of granola with chocolate and peanut butter in it. As soon as it cools down, I start eating this granola right off the baking sheet. The big chocolate chips are a bonus, scattered amongst crackly oats and seeds coated with peanut butter, baked with a touch of maple syrup. It’s a treat that I’ve been enjoying morning, noon, and night. And in between, too. You can swap out unroasted almonds (or another nut that you like) for the peanuts, but don’t be tempted to chop up a bar of chocolate and use those pieces instead of the chocolate chips. Store-bought chocolate chips are made of baking-resistant chocolate, formulated so they don’t melt while the granola is toasting. 2. In a large bowl, mix together the oats, chopped peanuts, chocolate chips, sunflower seeds, cinnamon, and salt. 3. In a small saucepan, warm the peanut butter, maple syrup, brown sugar, and water over low heat, stirring constantly just until the mixture is smooth. Don’t get the mixture too hot. 4. 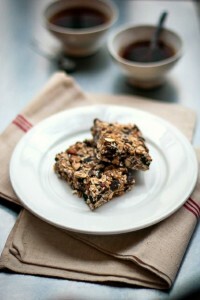 Scrape the peanut butter mixture into the dry ingredients and mix it in well, coating the oats, peanuts and seeds well. 5. 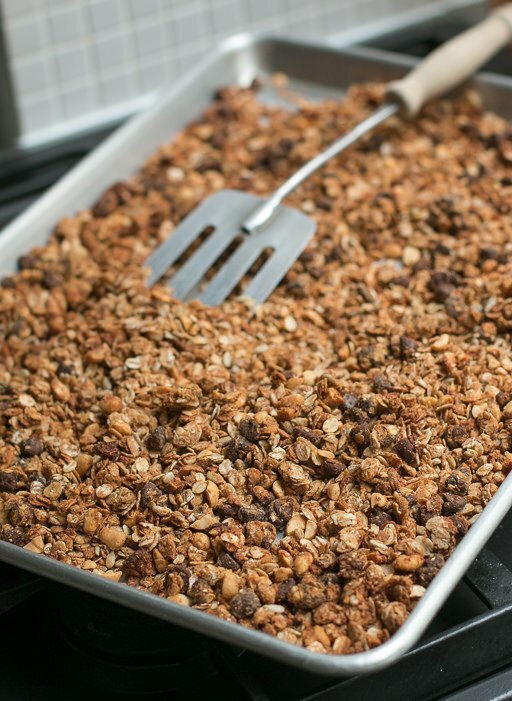 Transfer the granola mixture to a baking sheet and spread it in an even layer. 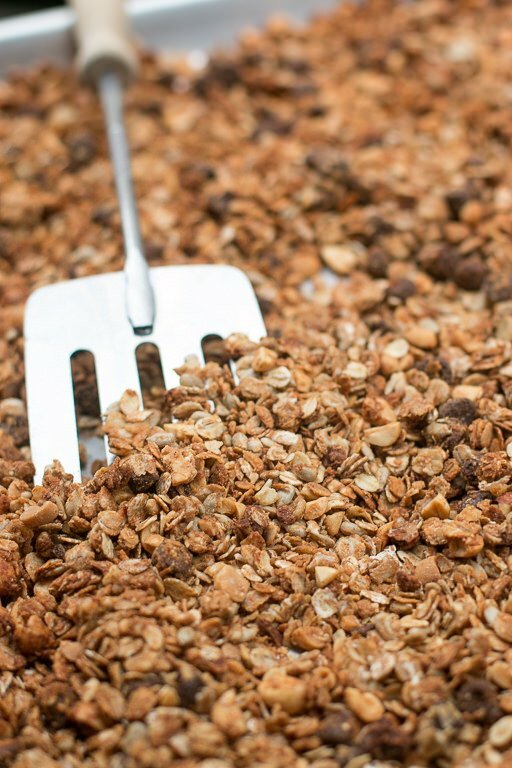 Toast the granola in the oven for 20 to 25 minutes, stirring a few times during baking, until the granola is a golden brown. (Be sure to stir from the edges, which tend to darken quicker than the center.) Remove from oven and let cool completely. I miss American granola, a lot! When I’ve bought muesli in France, I’ve been disappointed by the lack of sweet, crunchy clusters. 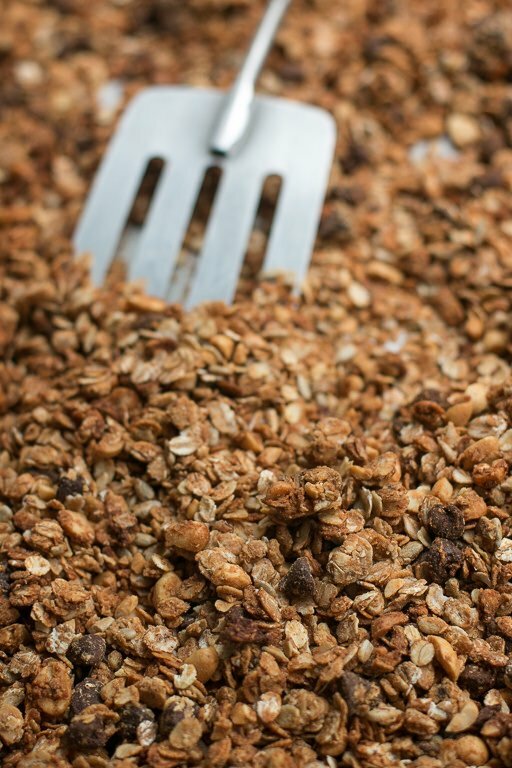 I thought that was the difference between the two–granola is baked and crunchy, while muesili is just a mix of oats and dried fruit. Maybe I’m wrong though? that recipe sounds just about perfect. i’m firing up a batch right now. thanks for the link to chocolate FAQs, most informative. Hello! For the expats in France: where do you find chocolate chips? I bring them back from the states, or people bring them to me as gifts. 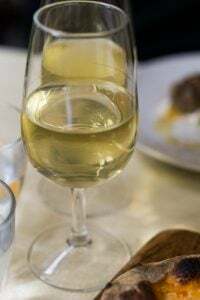 You can get them at La Grande Épicerie in Paris or at the expat stores, like Thanksgiving or The Real McCoy, or online at places like My American Market. The French brand Vahiné makes pépites de chocolat noir that come in tiny sachets. G. Detou in Paris also carries them, in bulk. 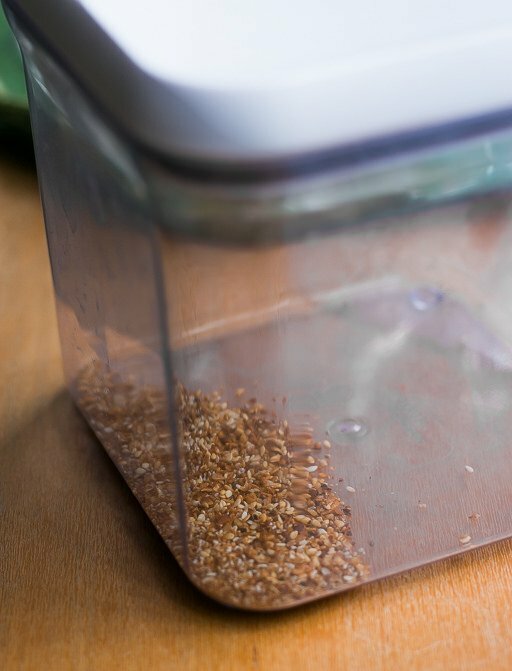 Love the unspoken hint photo of the seed mix – great idea to just make a bin of it to sprinkle everywhere…Looks like flax, chia, sesame? In any case, adding this to the recipe is just my kind of granola! I didn’t know chocolate chips were made with bake resistant chocolate — smart guy! I went to see a nutritionist once and she told me to eat fruit as a mid morning and afternoon snack — it really curbs my appetite especially at dinner. What are the nutritional facts for this granola? 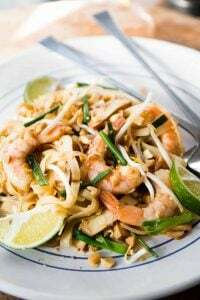 Looks yummy but on a low sugar, high protein diet. *coconut, *the oven: too excited to spell properly. This on vanilla ice cream or Greek yogurt is now all I can think about. I love that the peanut butter is mixed in, while the chocolate remains in chip form so you can experience those little bursts of sweetness! And for me, too, the hardest part of making granola is making sure it’s stored at some point, and not just eaten in its entirety off the baking pan with a spoon. I absolutely love Peanut Butter Granola – in fact, I made some for an event this past weekend. 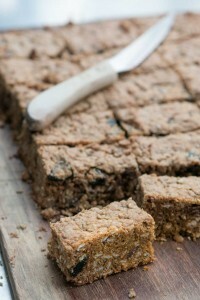 I looked at a few recipes, including the granola bar one that you have on this site, and made some additions and adjustments. Turned out fantastic, full of peanut butter, chocolate chips, dried cherries, dried apricots, and figs. Only problem is that I have a gallon sized Ziploc full of the leftovers that I keep digging my hand into every time I’m in the kitchen! Granola is something that never really excites me, but with chocolate chips and peanut butter…now that I can get behind! Sounds wonderful! Hello muesli, good-bye Kashi Lean. We are excited in Seattle about your visit. See you at Boat Street Cafe. That last sentence nearly did me in, I mean, whose house would have a smidgen left after coming in direct contact with this item? I’m considering doubling the recipe just to make it through the end of this week. Muesli is a Swiss word for a cereal using uncooked oats. I guess the French have altered the meaning. Yes, the French call granola muesli (without the ü). Sometimes they add the word croustillant, to signify “crunchy”, but not always. In Australia we call it all muesli, when it’s cooked we call it toasted muesli. Toasted muesli is generally higher in fat & sugar, but yummier. Sometimes people mix toasted with untoasted. I think you’ll find that muesli is uncooked (and is improved by long soaking), while granola is toasted (and isn’t!). I think if it were me, I’d make your recipe into bars, which I would then call flapjack, but I think that is something else in the USA, no? Meanwhile for authentic Swiss-style muesli, the kind we used to call “Swiss breakfast” at school, I have a very good recipe here, so you see, quite different – but equally delicious. You cannot go wrong with pb and chocolate! Thanks for this vegan recipe. I love a particular commercial peanut butter granola. Will have to give your recipe a go sometime soon! I eat granola more as a snack than for breakfast. Spoon is a favorite means of eating. No need for anything else. I definitely have a low-key addition to granola. I was the granola girl during my stage at Citizen Cake where I’d make 25 pounds of the stuff and loaded it up with coconut and nuts. Not necessarily the healthiest, but definitely delicious. I’m seeing this recipe with some almond butter! I’ve been told that adding a egg white prior to baking helps them form “clusters” for a more crunchy eating experience. Thanks for the great recipe. 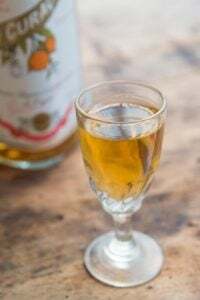 In joe yonan’s book he uses honey in place of maple syrup. His recipe for granola is very similar to yours. Also thanks for the tip on his book ,which is excellent. This looks delish! I usually put dried fruit in mine (after it’s toasted) but I quite like the idea of the chocolate chips. I also use honey as maple syrup is shockingly expensive here while honey is available in abundance. I do miss the taste of maple syrup, though. Not important, but granola is definitely a French word. Muesli generally refers to the untoasted variety but it does look like some French people also use muesli to refer to the toasted variety. Thank you for this. I have been on a mad Chocolate & PB kick and this recipe will keep me from eating my co-workers mini Reese’s Peanut Butter cups. I have always known that granola is quite simple to make. Still, I haven’t been even tempted to make it myself. Until now. Your pictures and description are so amazing that I can almost smell and taste that granola. Wow…definitely for cereal snackers. Hmmm, how about layered with yoghurt or over ice cream! Being from Oregon, I’m thinking of subbing hazelnuts for the peanuts and Nutella for the PB. Lots of variations possible… Thanks, David! This granola looks so decadent! I can’t wait to try it. This granola looks fantastic!! 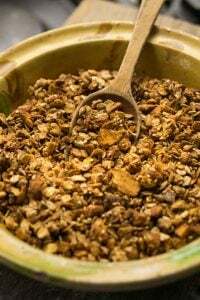 A friend and I made our first batch of granola recently, and have since been looking for more recipes. Granola, fruit, yogurt and honey is my favourite breakfast ever. Just a question – would you know where to get big tubs of plain yogurt (not fromage blanc) in Paris? Thanks a million, I’ve been missing the tartness of my morning yogurt lately, fromage blanc is just not cutting it. Most supermarkets and natural food stores in Paris sell plain yogurt in 500 gram tubs. I have seen larger tubs in Middle Eastern shops of Greek-style yogurt, such as Sabah (Marche d’Aligre) and others in various neighborhoods. For those who don’t get to enjoy oats, oh how I miss them, I just made ganache with a blob of peanut butter, some drips of vanilla, a sprinkle of salt and a dusting of icing sugar. Waiting for it to cool now. Will mix nuts in soon and spread out on sheet pan to cool even more. Why does EVERY granola recipe have cinnamon? Not that I have a problem with it, just curious. In order to stop the snacking, find something else to do with your hands. Knit, crochet, play cards. That is if you want to stop snacking. Snack is my favorite meal. I used Ghiradelli chocolate chips and they held their chippy shape until I gently stirred (about 10 min into baking) and all baking-resistance went south. Otherwise, divine! Yum! I always make my own muesli (granola) but this is a nice change up from my regular and healthier ones, will definitely be trying! On another (unrelated) note, could I please make a suggestion for a post? I would love to know how you file all your recipes? I use a big mix of book, magazine, website and blog recipes and I have really trouble filing them all (both on an offline). 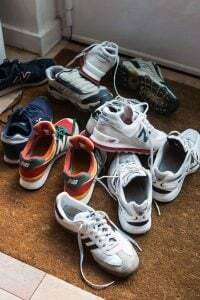 I would love to know your system for managing this given I’m sure you have a fairly large stash yourself both in hard copy and electronic! I just can’t work out the best way to go about it but I know you would have some pearls of wisdom! Chocolate chips are difficult to find in France? Not sure I could survive that. I’m guessing it would be fine to leave out the cinnamon, or perhaps I need to buy cassia. Turns out I’m sensitive to real cinnamon. Thanks for the great looking recipe. I need to try this instead of spending the bucks on KIND bars. Sadly, too much sugar for me (not that you’re saying it’s healthy), but it looks delicious! Sigh. Incidentally, the English English-speaking world (as opposed to American English) is with the French in calling granola muesli. Might be the first time the English and the French have agreed on anything:). I made the recipe 3 times this week before writing it up, and starting off using half the sugar but increased it because it seemed to need it. You could reduce it, however as-is, I didn’t find it overly sweet. Sounds delicious, I will definitely make this. Before I make too much of a mess, can I use Callebaut couveture (sp) chips? Easier to get than Nestle’s. I try to keep sugar to a minimum in my diet and made a version of this using orange juice and zest sans peanut butter and chocolate. I upped the seeds using a variety and used almonds instead of peanuts. Inspired from a recipe from Rancho La Puerta cookbook — not as sweet but still very good. I’m sensitive to chocolate — the caffeine gives me migraines. I often buy the little sachet of pepita- and they work ok for a chocolate chip substitution, but what type of Peanut Butter do you buy in Paris, I have seen Jiffy and I have seen some “natural” varieties for €12 jar at La Grande Epicerie, but I cannot find anything in between! I actually LOVE the dutch peanut butter Calve- but have to bring that with me on Thalys..
For this recipe, I tested it with peanut butter that I bought at the African store, that is virtually all peanuts & widely available (PCD brand, from Holland), as well as with American-style smooth peanut butter I have from the states. You can buy US peanut butter in many supermarkets in Paris, including Skippy and so forth. Natural food stores also carry peanut butter. You can read more about it at Ingredients for American Baking in Paris. Perfect snack to enjoy at anytime of the day! The muesli I’m most familiar with seems to be mostly rolled wheat, with a much smaller percentage of oats, always raw. Is it different to what’s traditional in Switzerland? Yes, a sizeable continuum in the ‘healthy to not’ range when it comes to American granola. I even used to make a honey and butter version (toasted oats and barley flakes) to tempt my convalescing son. Love your posts, David, and love reading the comments, too. I made this recipe right away except I didn’t have peanut butter or peanuts so I substituted almond butter and almonds. I ate almost half the batch once it cooled and ate it for breakfast with my coffee (no yogurt needed). Thanks David for this great recipe!!! Wouldn’t it be easier just to add the chocolate chips after the granola has cooled? Then there’s no chance of them melting. I like the minis for granola. I’m with you Julie – next time I’ll be adding the chocolate chips at the very end. At least with the brand I used, that would be better. David, I made the recipe using Nestle semi-sweet chips. Hard to do since my natural inclination would be to use a premium chocolate. I found the chocolate melted once the peanut butter mixture was incorporated. Not a bad thing, but not how I hoped it would turn out. Any thoughts on what went wrong? @David: I’m sure you got the sweetness level right, I just meant I don’t like to eat muesli with *any* added sugar (saving the calories for cakes) so regretfully will have to let this one pass. It looked so good that I printed the recipe, then mournfully shredded it:). Julie, Jane and Nina: I made this recipe three times using different kinds of peanut butter (natural-style, and commercial), as well as two brands of chocolate chips (one a store brand, the other a nationally known brand) and I didn’t have any problem with the chips melting. The reason I bake them is that they soften slightly, and meld a bit with the granola, rather than remaining distinct and separate when the granola is finished. You could certainly add them at the end, but as shown in the pictures, the two kinds I used didn’t melt when mixed or baked with the granola. I am glad you translated ‘granola’ for us non US citizens. I live in spain and here the English they learn is part UK part US, very confusing. Wasn’t meusli invented in Switzerland? Whatever, my dentist warned me off it. Once primitive mankind started eating grains his teeth suffered. (Not least from the bits of stone mixed in with the stone ground flour). Also when talking about muffins can you distinguish between US muffins – a sort of large, heavy fairy cake, (Sorry I can’t stand them) and English muffins or oven bottoms, a soft, slightly sweet bread bun which was cooked at the bottom of the bread oven.No space left unused see. Delicious things with or without fillings. Am saving your page as it looks wonderful. I found it looking for candied ginger as there is tons of fresh ginger on sale just now and I am also growing some in a pot. Stem ginger next, my mother was always going on about it. HA, just looked up stem ginger. of course a rhizome is a stem. that was all she was talking about. I thought she meant the above ground stems. silly me. Appreciate the reply David, your methods sound far too practical and straight-forward! ;) I am clearly trying to over-complicate things! I’m hung up on the part where you include the chocolate chips in the baking step. You don’t just mix them in after the baking and cooling steps? Thanks David. I get how the intent was for the chocolate chips meld into the granola and make the clusters. That’s what I was hoping for. I suspect my peanut butter mixture was too hot when I mixed it into the oats and chocolate chips…giving the recipe another try today. 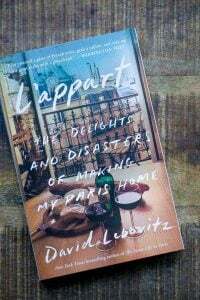 I think I’m going to buy your new cookbook, My Paris Kitchen, on kindle for my iPad when it comes out — too bad all books are not available to download! I resisted electronic books for a long time but it is so easy, cheaper, and I’m running out of room to put books. It seems like there is an explosion in publishing now — so many books I want, but can’t buy them all! Downloading from the library is a great idea, too. With my iPad it’s convenient to have what I need in the kitchen without having to run back and forth to my bookshelf or computer to print or look at a recipe. Ok, back to report on my second try. I allowed the peanut butter mixture to cool a bit before I mixed it onto the oat and chocolate chip mixture. As I suspected, on my first try, I added the peanut butter mixture when it was way too hot. This try the chips stayed intact during the mixing and baking process and melded nicely with the oats. There is always something new to learn! Thanks David! It’s delicious! David, were you doing the Boot Camp fitness that they have all over SF? My best friend did it for a few weeks, and quickly dropped out. I personally think she couldn’t handle waking up at dark o’clock. She handles getting yelled at quite nicely. How fortuitous this recipe is. I was just wondering if I had enough time to make tons of bread with the sunflower seeds using the recipe from Peter Reinhart’s Whole Grain Breads book. Or, I could use up all the seeds, along with all of these other ingredients in your granola recipe that have been languishing in my cupboard. I think I’ll go with yours. I’m making this TODAY. Sounds fabulous, and I can’t wait to put it on ice cream! Mmmm. My mouth is watering right now. I’m definitely going to try this. I too work from home and go from extremes of either forgetting to eat or eating a lot throughout the day. And sometimes not so healthy stuff. 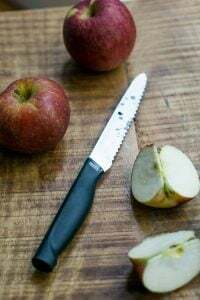 I’ve developed a sweet tooth over the years and I am constantly looking for better options to help satiate those cravings. I will try this recipe and swap out peanuts for cashews and almonds and maybe cashew butter or almond butter. As I am not a huge fan of peanuts. Thanks for this recipe. Why not put in the chocolate (chips or chopped “real” chocolate) after baking and cooling? Does the chocolate necessarily have to be toasted? Check in the previous comments, as I responded to others inquiring about that. 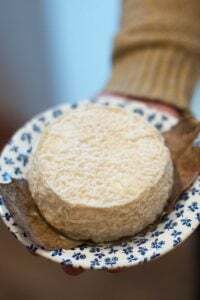 Would love to try this recipe as I love everything that goes into it- just for clarification where the recipe calls for rolled oats is that what the French call flocons d’avoine? I wasn’t sure because those seem more like a version of Quaker oatmeal. If not, where in Paris would you suggest finding rolled oats, so that I may satisfy this granola craving which your photos and descriptions have now stoked? Yes, that’s what they are called and you can find them at any natural food store, such as Naturalia, Biocoop, and Bio C Bon, amongst others. Some supermarkets may carry them as well. I just made this and I’m eating a small bowl of it with milk before it has even cooled down. I made it because I’ve been missing my favourite childhood chocolatey cereal, but it’s better than any cereal I’ve ever had. My chocolate chips melted too, but I don’t care. Could you suggest a less sweet version? You could probably cut the maple syrup in half. I haven’t tried it but that should work. I just made an altered version of this! I didn’t have all the ingredients, so I used almond butter and chopped walnuts instead of peanut butter & peanuts. I also added in chia seeds and a spoonful of coconut flour. My chocolate chips melted a lot, but it’s still really good! Our family has a (maple) sugar bush in Ontario. I ‘m thinking I might have to open a “sirop d’érable” boutique in Paris! Not sure what took me so long, but I made granola for the first time last week using Nigella’s recipe and it was ridiculously good. Who knew something so tasty could be so easy to make. The only change I made the recipe you posted was to use coconut oil and it was just magical. Next time, I’ll add an egg white for a clumpy end-product. This recipe looks fit for the clumpy granola option. 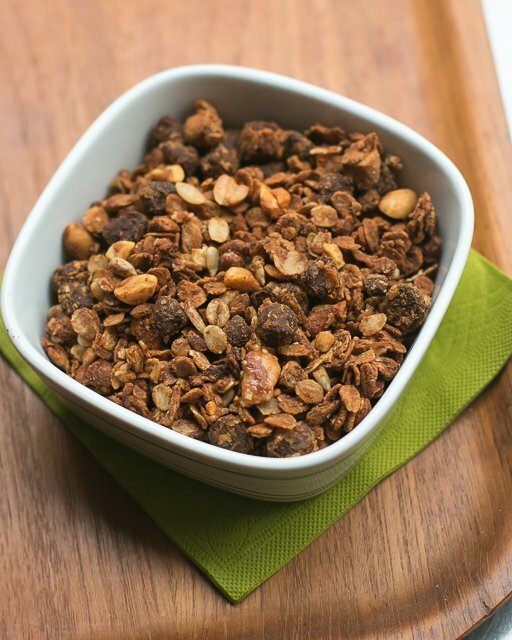 This peanut butter and chocolate chip granola is a treat any time of day. Had this for breakfast with milk. Made this today. Soooo good AND addictive. Trying not to eat it all before breakfast tomorrow. when i lived in France, fully 100% of everyone i met there made snide remarks about peanut butter. oh well, more for me! ;-) making this now. why am i roasting the chocolate chips with the rest, btw? mine are totally melted into the rest. Not complaining: this was already awesome before it was cooked! Americano turned Mediterraneo:This recipe looked so very appealing, but not being a chocolate and peanut fan, I made an altogether different version of this granola which turned out fantastically. I substituted the peanut butter and syrup with tahini and honey, the choc chips with 150 chopped dates and added 80 grams of sesame seeds. A fabulous recipe indeed, that allows for such a neat cultural turn about! All possible when you are cooking in Cape Town!